Restaurant innovators, RauDZ Creative Concepts Ltd. (RCC), are bringing their latest idea to life in downtown Kelowna. Like ‘The Okanagan Table’ cookbook that encouraged us to get in the kitchen and cook, this new space, ‘The Okanagan Table – kitchen | events | catering’ continues to share that enthusiasm with almost endless opportunities to enjoy food and its preparation. RCC co-owners chef and author Rod Butters, wine guru Audrey Surrao along with RCC Executive Director of Operations Bernard Casavant, bring years of restaurant and hospitality experience together with this latest project. Their award winning culinary, service and bar teams will continue to bring their warm hospitality and experience to The Okanagan Table – kitchen | events | catering. Located in a beautiful heritage building at 1571 Pandosy Street, steps from popular local retailers Mosaic Books and Olive & Elle, The Okanagan Table – kitchen | events | catering adds a fifth location to the successful RCC restaurant group, consisting of RauDZ Regional Table, micro bar & bites, Sunny’s Modern Diner and Terrafina at Hester Creek by RauDZ. The Okanagan Table – kitchen | events | catering is unlike their other spaces. It’s not a restaurant; it’s a unique venue for use as a kitchen, customized event space, off-site catering preparation. Award winning architect Tim Bullinger of Arca 3 Design Studio, who designed the RauDZ bar, micro bar • bites and Sunny’s Modern Diner is creating both a highly functional but upscale environment combining function with a dash of glamour. Local trades have already begun work in the space with an anticipated summer opening date. The kitchen will become the commissary kitchen for the four RCC restaurants allowing the culinary teams increased space to facilitate whole animal butchery, stock making, in-house training as well as lots of space for pastry chef Jason Whitfield to develop his desserts and treats for the properties. In addition, this unique space provides the setting for almost unlimited creative events. With seating for 30 or stand up reception space for 50, the space will host chef-led cooking classes, wine education seminars and tastings, and private events. Moveable telescopic tables will run down the center of the space providing what Chef Rod Butters describes as the ‘ultimate chef’s table’ dining. What used to be reserved exclusively for VIPs can now be yours at The Okanagan Table – kitchen | events | catering with guests seated steps away from the kitchen action, and menus created especially for the evening with wine pairings carefully curated to heighten the experience. With the addition of the commissary kitchen RauDZ will now be able to facilitate off-property catering for exclusive private events with menus created by the RCC award-winning culinary teams utilizing the very best fresh, local and seasonal ingredients. Jars of the addictive RJB Blackberry Ketchup, copies of the best-selling cookbook, ‘The Okanagan Table: The Art of Everyday Home Cooking’ and some exclusive kitchen wares that the RCC culinary teams use and love will be available in a small retail area as well. Limited food items including the house made ‘Soul Stock’ will be ready for take-home use. Over the years, RauDZ Creative Concepts has built a brand that attracts talent and aligns with the best in the industry while creating a quality experience for the guests. The opening of The Okanagan Table – kitchen | events | catering in Summer 2019, allows the RauDZ team the opportunity to fulfill the frequent requests from guests for cooking classes, catering, private parties and other creative culinary experiences. Visit www.theokanagantable.com for more information. Sunny’s Modern Diner will be OPEN for Family Day on Monday, February 18 from 8:30 am – 2:30 pm. Happy Family Day everyone! 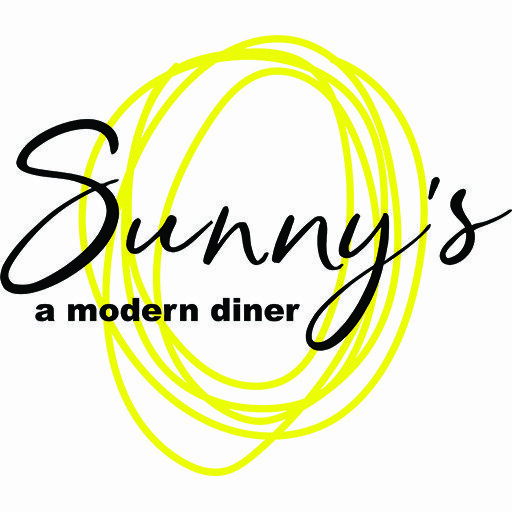 Sunny’s Modern Diner will be closed January 2 – 17 for vacation. Sunny will be enjoying long walks on the beach, games of fetch and afternoon naps. We will be back Friday, January 18 at 7:30 am. This article was written by Twyla Campbell for eatnorth. You can read more here. Change comes to the valley. It was at Amuse, an event in March held to showcase the area’s best food and drink, that I noticed a shift in Kelowna’s culinary scene. More than 50 restaurants, distilleries, wineries, cideries and breweries featured their products in a food and drink pairing extravaganza that entertained and fed 500 guests in the Centre for Learning at Okanagan College. I was one of three judges tasked with tasting and scoring the entries. Guffaw if you will, but our jobs were not easy. The level of food execution and the quality of the drinks were unbelievably and surprisingly good. 50th Parallel Winery and its restaurant, Block One, took top honours in three categories. It shows what’s happening in Lake Country where five out of the eight wineries operate top notch restaurants; two of them (Block One, and the Garden Bistro at The Chase Wines) opened just this year. Both are housed in stunning buildings and both adhere to the ideology of using seasonal, locally sourced ingredients. If I had to wrap up the Kelowna food scene in one sentence, it would be all about the feels: the food coming out of newly opened kitchens is thoughtful and compelling, and the people who make it are doing it for the right reasons. They want to feed you food that makes you feel good. That’s exactly the approach taken by Kelowna restaurant pioneer Mark Filatow. This Okanagan chef opened Waterfront Café and Catering on Abbott Street in the waning weeks of 2017, making him miss the boat on “best of” lists like this. So, take note and grab a table. Every year, Filatow wins awards and recognition for Waterfront Wines for good reason. The café, although more casual, should garner the same respect because the food is of equal quality, which is to say, spectacular. 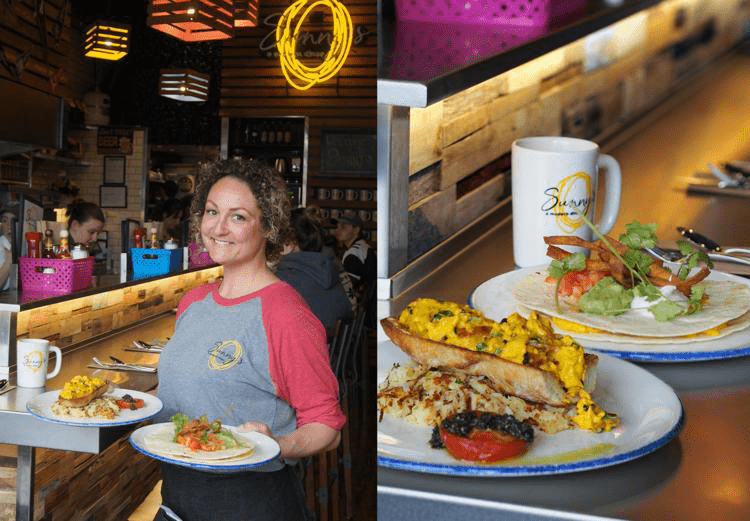 Speaking of pioneers, Audrey Surrao and Rod Butters, the duo behind Raudz, Micro and Terrafina (at Hester Creek Winery in Oliver) opened a much needed breakfast spot called Sunny’s Modern Diner. After all that liquid consumption, you’re going to need a big plate of whatever they’re serving at Sunny’s the next morning to set you straight. Pro tip: the breakfast poutine with fries (or hashbrowns), cheese curds, beef brisket, fried egg and hollandaise is a lifesaver. The following article was posted on KelownaNow by Savannah Bagshaw on June 20, 2018. 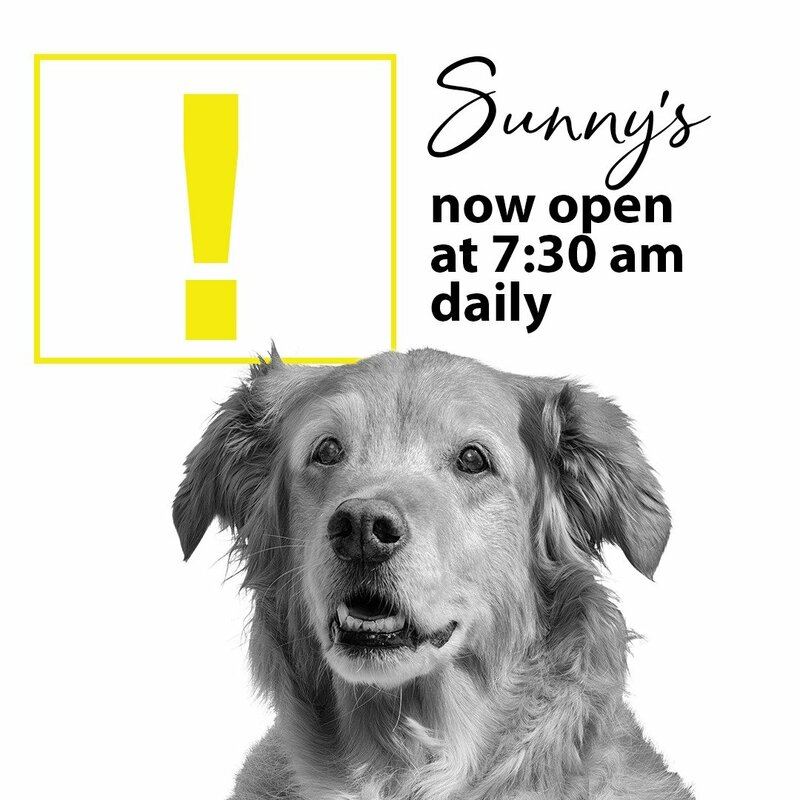 To add to the already glimmering sunshine today, local eatery Sunny’s Modern Diner is fixing to spread their own form of cheer. In honour of National Milk Shake Day, the new Bernard Avenue restaurant is donating $1 from every shake sold to the SPCA. This isn’t the only time Sunny’s has beamed with philanthropy. It is common knowledge that year round, customers can play DJ while dining and pick their favourite album from the restaurant’s personal vinyl selection to spin for a donation to the SPCA. 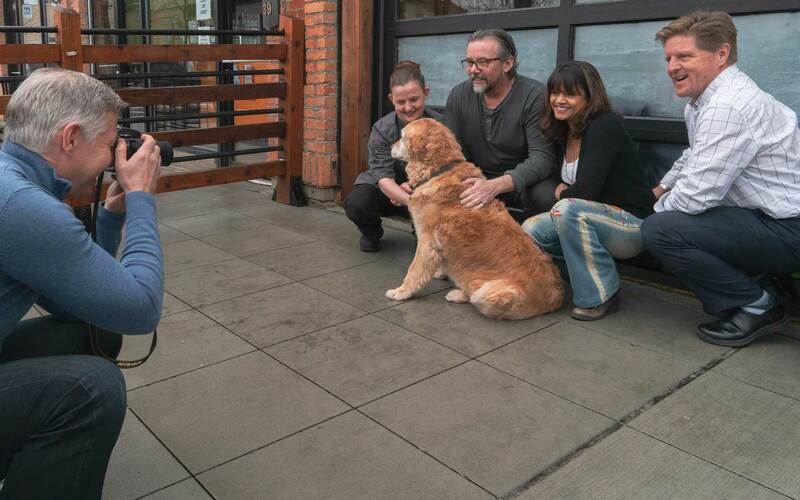 The love of the SPCA comes from the restaurant’s mascot, 14-year-old golden retriever, Sunny. Perfect to cool you down while enjoying the Okanagan heat, the diner offers old-school shakes in the classic flavours of strawberry, chocolate or vanilla. If you have nowhere to be, you can even go as far as to add a splash of your favourite liqueur to amp things up a bit. 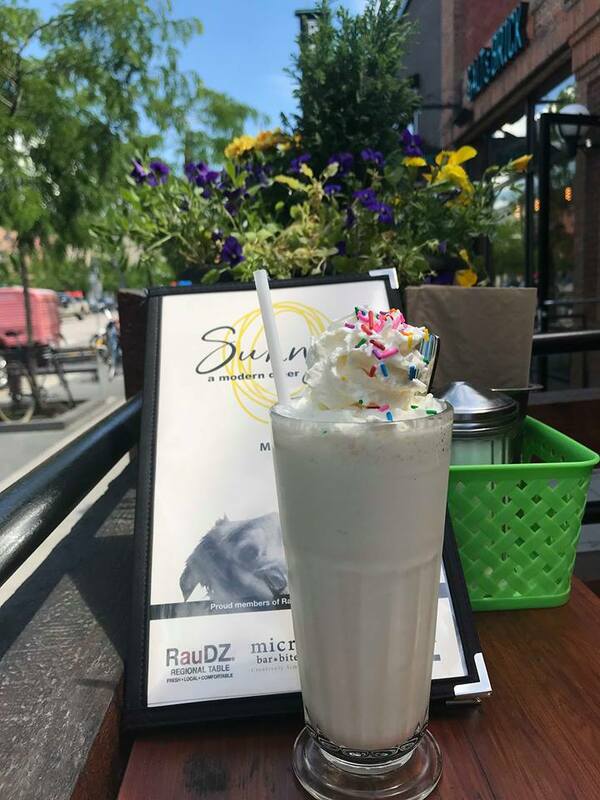 “It’s a great opportunity, especially on a day like today, to pop by in the late afternoon, enjoy a milkshake and support the SPCA,” said Sunny’s Chef and Manager, Robyn Sigurdson. A stack o’ brown”, “a cup of joe,” and “two eggs lookin’ at me.” These are just a few phrases that emerged out of diner culture, a language spoken between waitress and cook to expedite short orders at the pass. The diner was the place to go for gossip and sustenance, a place where the coffee was bottomless, the wait staff sassy and the service snappy – with food, a bit greasy. The lexicon, like restaurant culture itself, has evolved over time. It’s a language largely forgotten, supplanted by other lingo, menus and locally roasted coffee. Save for a road trip to small town America, where diner culture is still evident, along with museums that have tracked its history, it’s a culture that’s quickly vanishing. Welcome instead, a road trip to Kelowna, and the recently opened Sunny’s, a Modern Diner, at 235 Bernard St. in historic downtown. The newest culinary adventure by RauDZ Creative Concepts, Sunny’s pays tribute to the diner with a breakfast-all-day menu coupled with fun, modern twists by chef Rod Butters, one of the owners, along with Audrey Surrao. Both are well known restaurant industry veterans, acclaimed for their popular RauDZ Regional Table, and Micro Bar & Bites in Kelowna, and more recently, Terrafina restaurant at Hester Creek Winery along with the release of an award-winning cookbook. They’ve also appointed noted chef Bernard Casavant as executive director of operations to their team, perhaps hinting at more concepts to come. Sunny’s is a long, narrow 34-seat space with exposed brick and retro touches such as souvenir pennants, a neon sign and cool, colourful light fixtures repurposed from wooden crates. It’s named for the owner’s Golden Retriever, and the pooch’s happy portrait features prominent on one wall, acting as watchdog over the space. Grab a perch overlooking the open kitchen where you can watch your meal come to life by “top dog” Robyn Sigurdson, and her troop. Start your day with a bracing cup of java – bottomless by the way and locally custom roasted – along with one of Mom Wright’s rich butterhorns, served warm with a drizzle of icing and walnuts. The menu delivers hefty sustenance peppered with diner lingo. For example, Door Stops (French toast), Cluck and Grunt (eggs with bacon), and Chicks on a Raft – aka scrambled eggs on toast – are given signature treatments to set them apart. 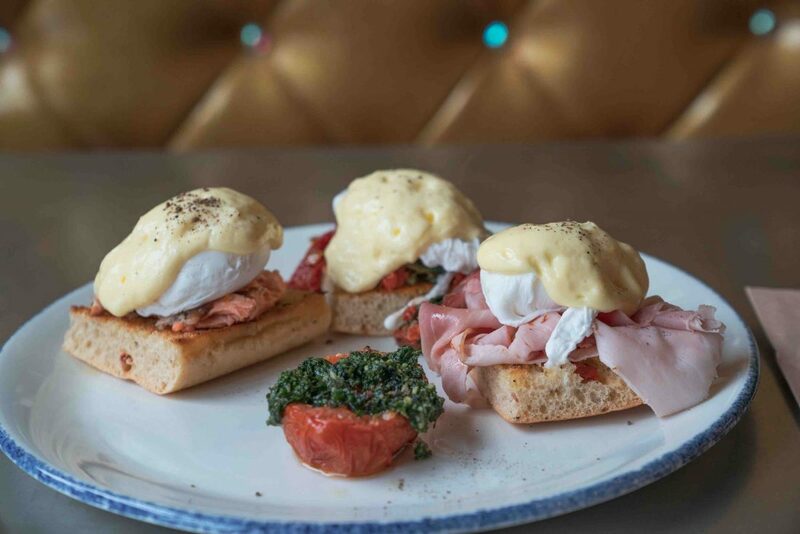 And modern-day wonders such as breakfast poutine hash, eggs benny with Illichman’s ham, or the green eggs and ham of poached eggs on a giant ham steak with a pumpkin seed pesto, piggy puffs, hash browns and toast, compete with chicken and waffles, and triple stack pancakes. All suggest that you may want to forgo bikini season this year. (There is a garden bowl, and a simple toasted Mount Royal bagel with halibut pastrami for those of a delicate nature, and most dishes can be made vegetarian). Sunny’s Chicks on a Raft consists of a toasted baguette slathered with peanut butter – yes, that’s right – topped with creamy scrambled eggs flecked with Illichman’s molasses bacon and sharp cheddar, with a side of hash browns and a grilled tomato garnish. The eggs are free range and the hash browns are made fresh, not frozen, and grilled on the flat top with butter. It’s exquisitely rich and delicious, and that peanut butter is a revelation. The El Presidente consists of two flour tortillas sandwiching scrambled eggs, cheese, griddle beans and spicy chorizo, topped with avocado, sour cream, tomatoes and a wonderful pickle-y salsa verde that cuts through the richness. Lunch, served at 11 a.m., rounds out the menu with sandwiches, fish and calamari with chips, burgers – 2 Cows Make ‘em Cry (aka two beef patties with onions) – and the Butcher’s Revenge of a jumbo meatloaf ball on French bread with mushroom gravy and onion rings. You might want to add a milk shake with sprinkles – you won’t be judged – with adult liqueur-spiked versions available. Happy Hour starts at 7:30 a.m., when they open, where cakes, floats, fruit pies and side orders are the norm and coffee is only a dollar. Add-ons include local Arlo’s honey, custom Illichman’s meats and Love’s maple syrup. The soundtrack is provided not by an iconic jukebox but by a turntable with vintage vinyl for guests to spin such 60s throwbacks as Herb Alpert and the Tijuana Brass or Santana. Sunny’s will open their garage door to a 14-seat patio in the summer, where the hours will extend – they’re only open to 3:30 p.m. at the moment – and the Power Hour commences at 2:30 for fermented grape juice (wine), craft beer and two dollars off their signature Caesars topped with pickles and celery with Cheez Whiz. Dog soup (water) is always free. Click here to read the full article with photographs.